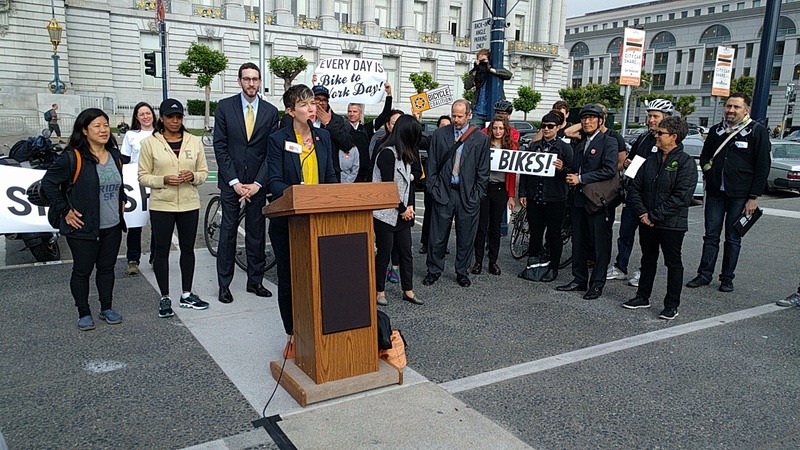 Margaret McCarthy, Interim Executive Director of the SF Bicycle Coalition, gives a rousing speech in front of SF City Hall. Photo: Streetsblog. The crash, still evident by a spot of blood on the white of her left eye, left her understandably shaken. So she took advantage of Bike to Work day to get past that. She was there bright and early, at 7:15, in front of the Foglifter Cafe–just down Ocean street from the site of her wreck. 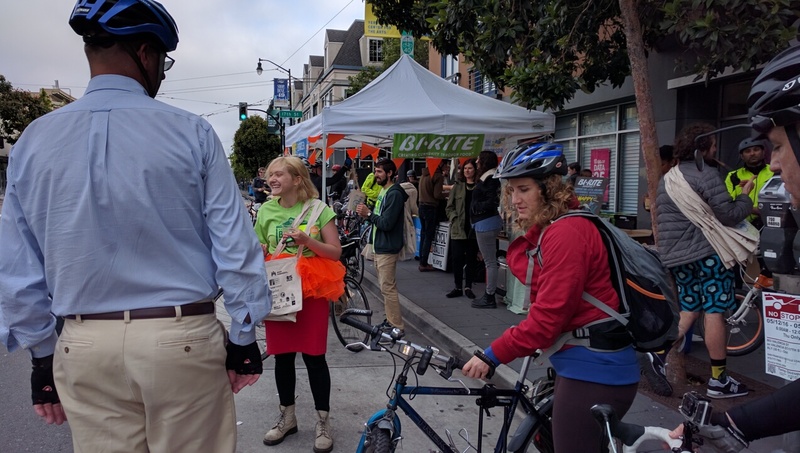 Shaber joined the commuter convoy from Ingleside (the San Francisco Bicycle Coalition, SFBC, organized convoys leaving from eleven locations throughout the city). It was led by Janelle Wong, operations manager at the SFBC. The convoy was joined by Isabel Huo, a student in accounting at Golden Gate University, and Mak Gill, a nurse at SF General Hospital. Mak cycles to work daily and Huo is a novice, so it was a mixed group. 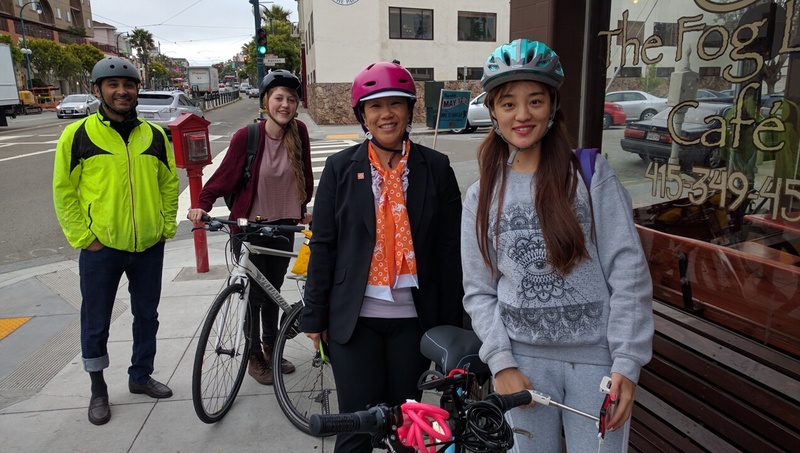 Mak Gill, Julia Schaber, Janelle Wong, and Isabel Huo gathered in front of the Fog Lifter, one of eleven start locations for commuter convoys on Bike to Work Day. Photo: Streetsblog. The ride started on Ocean and, under Wong’s confident lead, the group made its way Southeast to Phelan. Wong led her convoy through this precarious left turn from Ocean to Phelan. Note this is the same location where Anthony Ryan was attacked last year. Photo: Streetsblog. 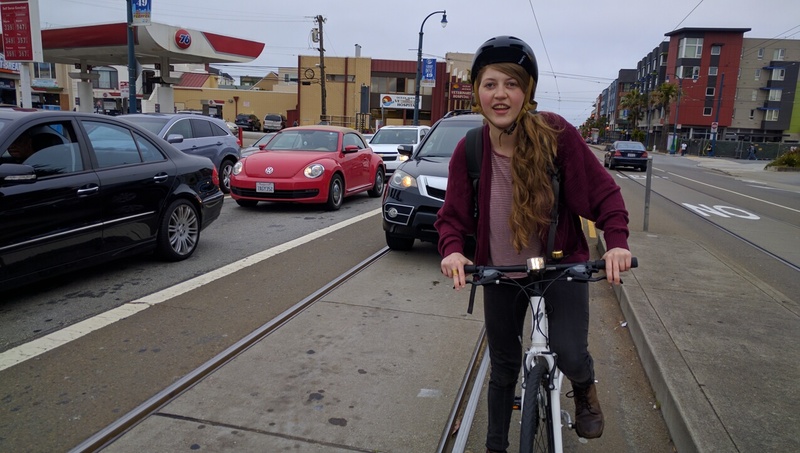 Between the Muni tracks, heavy traffic, and lack of bike lanes or protection, Shaber seemed understandably skittish—especially since they were cycling so close to the site of her crash. “I’m still feeling some PTSD,” she remarked. Oddly enough [heavy sarcasm here], the occasional sharrow marking didn’t seem to provide much comfort. But once the group turned onto Phelan, and then eventually made its way to San Jose Street, Shaber seemed more relaxed. 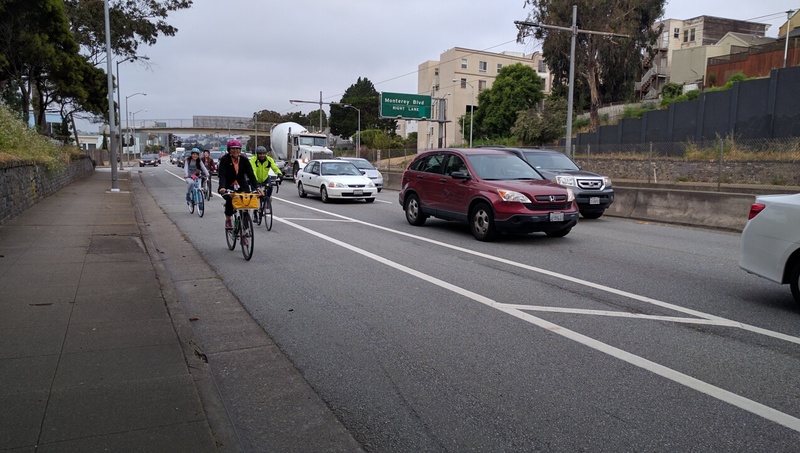 Some of that was no doubt because the group was encountering some of San Francisco’s steadily improving infrastructure, such as the sections of bollard-protected bike lane on San Jose. 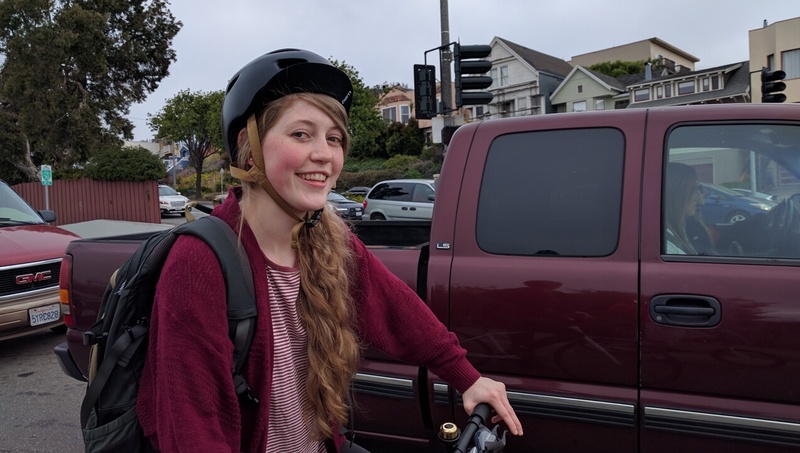 Schaber started the ride a little skittish, especially when navigating a stretch of Muni tracks just a few hundred feet from where she crashed last month. Note to the motorist behind her: do you really need to be that close? Photo: Streetsblog. Wide, buffered bike lanes help make cycling safer and more comfortable here, although it’s unclear why the protection bollards stop on this stretch of San Jose. Photo: Streetsblog. On today’s ride, Shaber was, albeit indirectly, bothered by other cyclists. “I was super hesitant today…there were too many bicyclists for one lane, passing on the left and the right.” In the Netherlands, there’s “more than enough space on a bike lane for cyclists to pass.” Shaber argues that San Francisco needs protected bike lanes but they have to be wide enough for cyclists to overtake comfortably–not to mention evade car doors and other obstacles. That said, she felt great about the fully protected contra-flow bike lane on Polk. One of several “Energizer Stations,” complete with snacks and air pumps, along the commuter convoy routes. Photo: Streetsblog. Shaber had a little trouble keeping up at the start of the ride, but was back with the group as it rode the Polk lane to the finish, where they watched the closing event at City Hall. 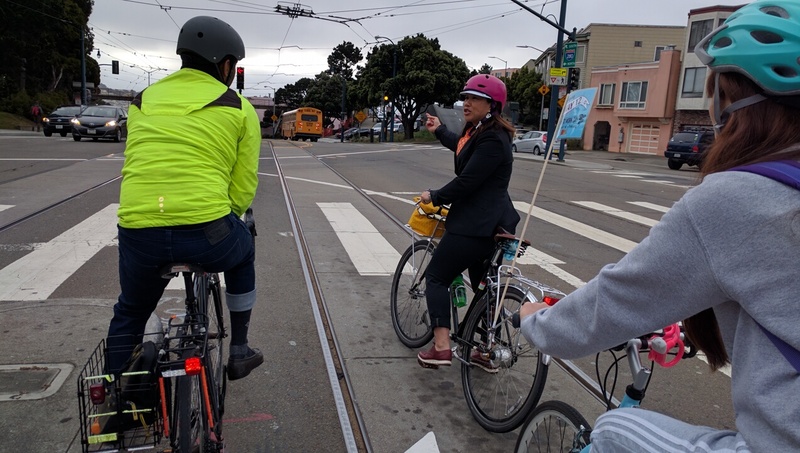 In addition to McCarthy, several supervisors who had participated in the ride addressed the crowd, including Katy Tang, Scott Wiener, and Jane Kim. The fully protected bike lane on Polk Street. Bike advocates agree it’s this level of infrastructure that’s required to make cycling truly safe and comfortable for all. Photo: Streetsblog. The crowd at SF City Hall listing to advocates and lawmakers. 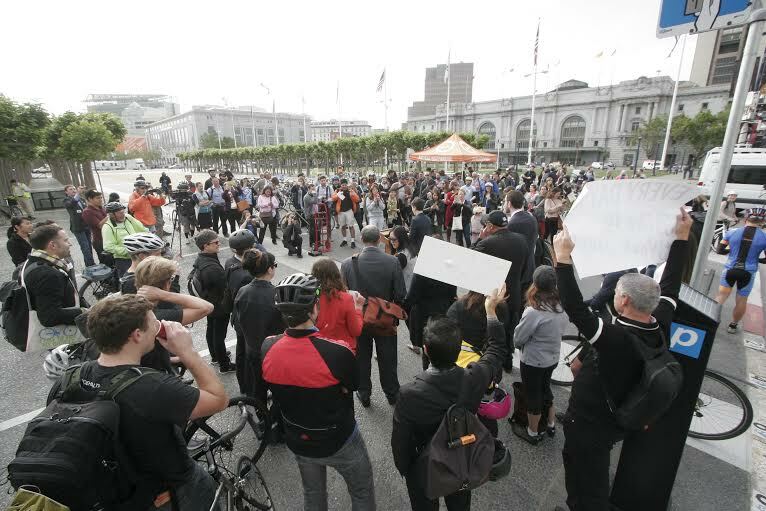 Photo: SF Bicycle Coalition. Shaber, meanwhile, was busy taking photos during the presentations at SF City Hall. But is she over her crash? “A little,” she said. “I’ll probably always have an association with tracks, but riding with a group helped build my confidence back up a bit.” And we think she’s off to a good start: look at the smile on her face in the photograph below. It’s amazing what a bike ride with new and old friends can accomplish. After a few miles Schaber was groovin’ the ride. Photo: Streetsblog. District 11 represent, big hug Julia, thanks Roger. 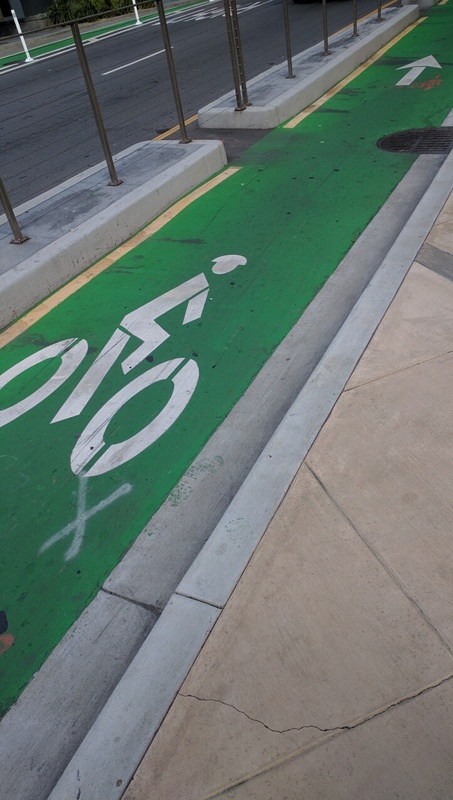 “San Francisco has come a long way.” When it comes to cycling? Well kinda, more like rather San Francisco has a long way to go, especially if we want to really make San Francisco a GENUINE biking city, because honestly it still isn’t, at least not yet. Reminds me of discussions about civil rights between whites and blacks. Whites always point out how far civil rights have come in the last 60 years, whereas blacks always focus on what they claim is still be done. From < 2% to 4.4%. When you have a small base figure a small gain can look large, when expressed as a percentage. Both can be true at the same time. If you’re in Salt Lake City on a trip from San Francisco to New York you have certainly come a long way. And there’s still a long way to go. Either she has very bad memory or hasn’t spent a lot of time in either city, especially Amsterdam. The reality is that there are numerous instances where trams and bikes share the same space or where bikes and cars share the adjacent travel lanes. The real issue with the situation there in SF is that what should be a transit-only area is serving double duty as a left turn lane. That is something that is something that needs to be addressed. And yet it’s still true that the number of people bicycling tripled. Or do statistics and data only count when the number is above some arbitrary threshold you determine?